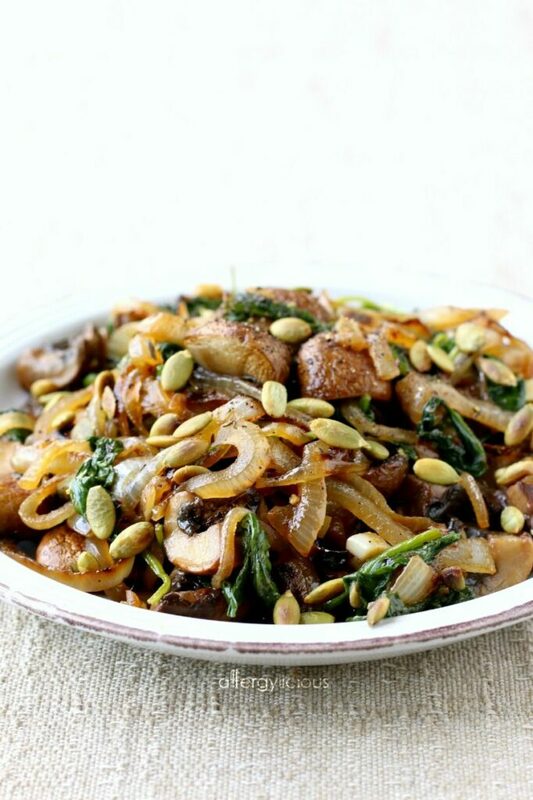 Earthy, meaty mushrooms dance between layers of sweet caramelized onions & tender baby spinach with the delightful crunch of toasted pumpkin seeds. I love this mushroom sauté with caramelized onions! Is that too bold to say? Usually I would tell you a little story about how this recipe came to be and end with how delicious it is, but not today my friends. I’m changing it up and going BIG! I’m shouting it from my desktop that this sauté is the BOMB! Toast those pumpkin seeds! Don’t skip this. Raw seeds can be satisfying to eat on their own (meh, kinda) but toasting them releases their natural oils and deepen flavors that wouldn’t be exposed otherwise. Toasting them also increases their crunch which is what makes it the perfect compliment to our mushroom sauté. SO if you don’t want to sacrifice flavor or texture, toast away! Step 2 you don’t want to skip….caramelizing the onions. Don’t worry, you still use 1 skillet for everything (”yay”), but this comes after the seeds are toasted and before the mushrooms start sautéeing. Caramelized onions add the sweet & savory element to this mushroom sautée but the intense flavor that only happens when the onions cook down alone. Trust me, caramelize them on their own, you won’t regret it. This makes a delicious side dish all on its own, but you can also pair with your favorite grain to make it a meal, like we did. 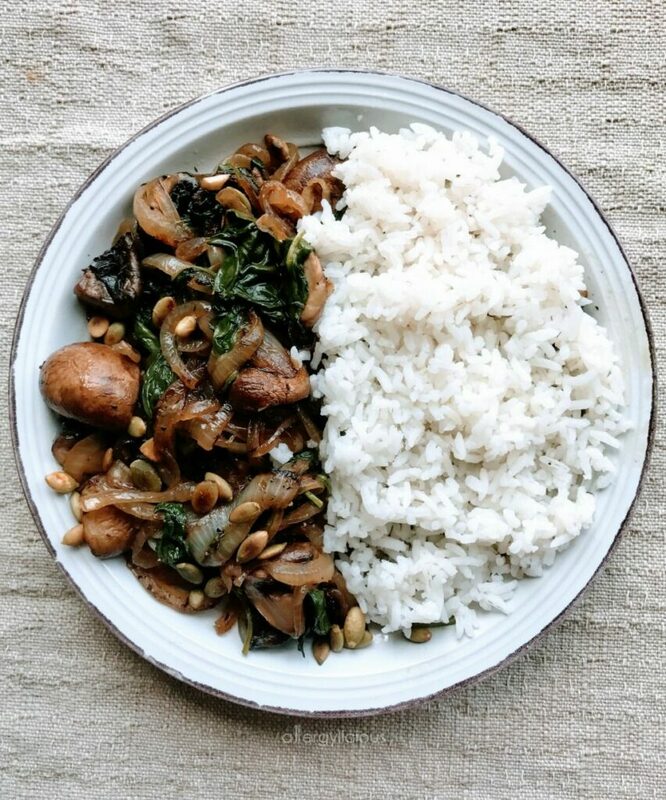 I’m even thinking how amazing this mushroom sauté would taste top of a veggie burger too. You just HAVE to make them and share the creative way you incorporated them into your next meal! You guys are going to quickly agree that this is the best mushroom sauté you have ever had! This little plate is loaded with irresistible flavor. 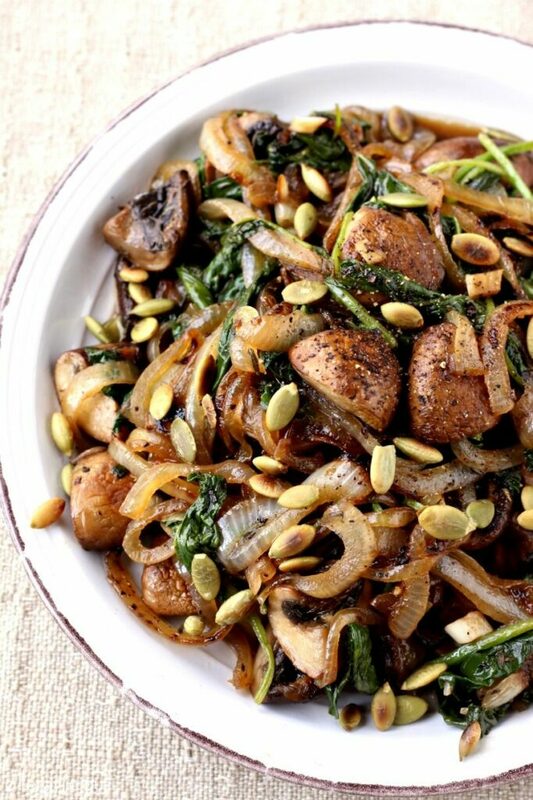 Earthy, meaty mushrooms dance between layers of sweet caramelized onions & tender baby spinach with the delightful crunch of toasted pumpkin seeds. Prepared grain such as rice, quinoa or pasta if desired. Preheat a dry skillet over medium. When hot, toast the pumpkin seeds just until golden. Remove from pan & set aside to cool. Place skillet back on stove & melt 1 teaspoon of coconut oil over medium heat. Add onion & sprinkle with a pinch of sea salt. Stir occasionally, letting the onions caramelize, approximately 10 minutes. Remove onions from pan and set aside. Place skillet back on stove and melt remaining teaspoon of coconut oil. Add mushrooms and let them cook down into a pretty brown color. Sprinkle with thyme and add garlic then cook another minute for flavors to blend. Fold in spinach leaves and balsamic vinegar. When spinach starts to turn bright green, add caramelized onions then season with fresh ground pepper and a pinch of salt. 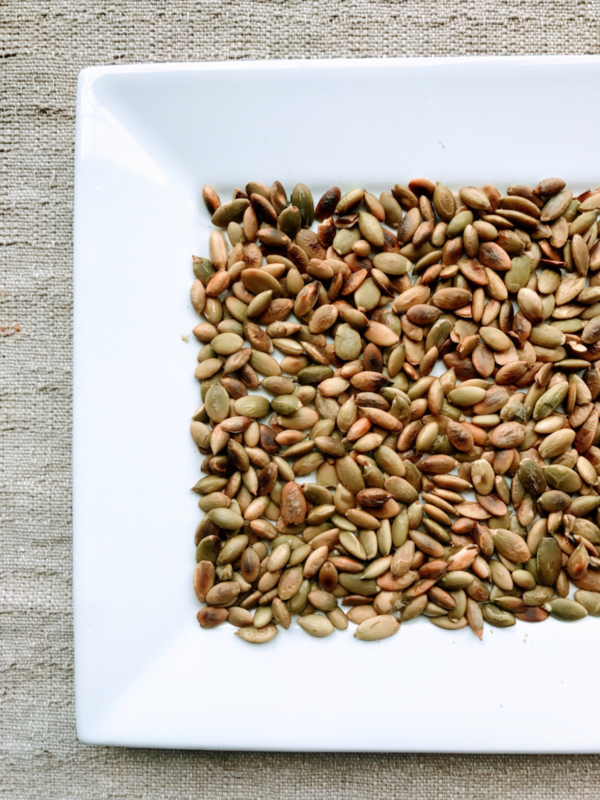 Serve in a bowl or on a plate & sprinkle with toasted pumpkin seeds. Enjoy as is, as a side dish or with your favorite grain (we like rice). If you give this recipe a try, please leave me a comment below with your feedback. I’d love to see your amazing pictures too, so be sure to #allergylicious. I love everything about this meal! Caramelized onions, mushrooms, and spinach together are my idea of heave. Thanks Aimee. Caramelized onions are the best, aren’t they. I LOVE mushrooms and caramelized onions! This is totally my kind of meal, and I’m with you, I usually create a meal from adding a little (or a lot) of this and that until it’s just right. So much more fun that way, isn’t it? This sounds fabulous! I love mushrooms!! My grandma put mushrooms and onions in everything when we were growing up. I still get excited when I smell them cooking together – divine! That’s how I grew up too! I love those food smells that take you back. Caramelized onions and mushrooms and toasty seeds. It sounds perfect to me! Mushrooms are one of my favorite ingredients and caramelized onions are beyond delicious. This is the perfect recipe for me. It looks so tasty! Oh this is fabulous. I absolutely love what you’ve done with these ingredients. I do something similar (but different). Big yes to this one. I LOVE mushrooms! And caramelized onions. This is jackpot for me! It’s hard to turn down caramelized onions, thats for sure.